Ben Murnane is only 24 years old, but already he has been to hell and back. Having been born with a very rare disease, he has visited death's door many times; he has endured terrifying psychosis and has known the joy of recovery. "From the moment I was born, my parents felt I wasn't quite right," says Ben. "I was small and they had to dress me in doll's clothes. I just didn't thrive, and although I was medically examined, no one thought to do a blood test." So, the family had no option but to soldier on. Then, in 1993, when he was nine, Ben's physical health began to markedly deteriorate. "I had excruciating stomach pain and red spots under the skin. My mother heard a programme about leukaemia and she thought my symptoms sounded similar to those, so she took me for blood tests," Ben says. The investigation revealed his platelet count and red and white blood cell counts were right down. "This was pretty bad news," recalls Ben. He was immediately packed off to the children's hospital in Crumlin for some serious tests, which initally suggested aplastic anaemia. General anaemia occurs when there is a drop in the number of red blood cells; aplastic anaemia, however, happens when there is a reduction in all three types -- in other words, when the body's bone marrow is failing to do its job. "The way to fix bone marrow is to have a transplant," says Ben. But as that has its own inherent dangers, it cannot be done lightly, and donors are hard to come by. Although the doctors were desperately worried, Ben was sent home to spend Christmas with his family. "There was a very real issue about whether I'd survive," he remembers. After the festive season, Ben returned to hospital so the aplastic anaemia could be tackled. But on the day the treatment was to begin, the family learned that Ben actually had Fanconi anaemia. "Aplastic anaemia was a very serious illness, but Fanconi anaemia is even worse," says Ben. "Two out of every million children are born with the disease." Fanconi anaemia is an autosomal recessive genetic disorder, which means that both parents must be carriers in order for a child to inherit the condition. Further tests revealed one of Ben's two sisters was also affected. The Murnanes were devastated, but there was no doubt about the diagnosis. Ben displayed some of a cocktail of symptoms typical of Fanconi anaemia, including aplastic anaemia, skin discoloration, and small stature for his age. Other possible symptoms include intellectual disability and kidney problems. The Ashkenazi Jewish population carrier frequency of the recessive gene is much higher than in other ethnic groups, at about one in 90. Ninety per cent of Jewish children born with Fanconi anaemia have no thumbs at all. Ben, who is not Jewish, has double jointed thumbs. But the bad news didn't end there. "Fanconi anaemia patients are hundreds of times more likely to develop cancer, while the average life expectancy is just 22," says Ben in his harrowing, but inspiring book, Two in a Million. Over the years, treatment would prove difficult and frightening, but ultimately successful. Initially, Ben was put on an anabolic steroid called oxymethalone to boost his blood count. "Once I was over the shock of being sick, I thought it was a bit of a thrill to have this thing that no one else had," he says. The oxymethalone wasn't working effectively, though. As time went on, Ben required ever-higher doses, and consequently he became bloated, his voice broke early, and he developed horrendous acne. Eventually, when he was 11, Ben was put on another steroid, which led to him becoming anorexic and prone to outbursts of temper. "What that steroid did was make me go ballistic. My parents were terribly worried. I hit them more than once," Ben recalls. Despite this unruly behaviour, the doctors were unable to take Ben off the medication as his blood count was finally improving. The theory was that this drug would kick-start the original drug into action. And that's exactly what happened. But the situation again deteriorated when Ben was 13. His skin got so bad it was like having "dandruff" on his face; he was also terribly tired and developed worrying, but benign, growths. Eventually, when he was 15, the doctors were finally forced to wean him off steroids -- they were no longer working. Ben was now really sick, and he desperately needed a bone-marrow transplant. The first matching, unrelated donor backed out at the last moment. By then, Ben had already cleared out his school locker and said farewell to his friends -- his chances of survival were only 50/50. 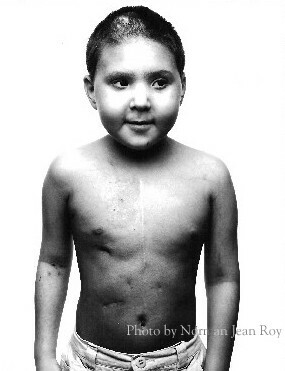 Then an American donor was identified and, in June 2001, Ben headed for Crumlin and began the process. "The type of bone-marrow transplant I was about to undergo was new, and I was going to become the first person in Ireland to have it," says Ben. "It involved a revolutionary immunosuppressant drug called fludarabine." Nonetheless, the risks were still very high. On June 20, Ben began radiation. On day six he was moved to the transplant room, a completely sterile environment: there, he was injected with his gift of healthy bone marrow. "The actual transplant itself was about as undramatic as it gets," remembers Ben. "It was painless and lasted just 10 minutes." The critical time was yet to come and Ben's patience would be sorely tested. He had a bumpy ride, haemorrhaging weight, suffering chronic diarrhoea, blood in his urine, considerable pain and finally, a dramatic psychosis. The physical battles had been going on for some time, and as they got worse, Ben descended into an almost comatose delusional world. "Over the next few days my mind constructed a nightmare life for me. My parents had been killed in a car accident. The rest of my family had been killed in a plane crash. I'd been sent to a juvenile hospital and tied to a bed. I heard constant screaming. I saw the baby in the next bed being beaten and stabbed by nurses." Following frantic tests, it was determined that Ben was having a bad reaction to a drug that was fighting a severe infection, which sometimes occurs after a bone-marrow transplant. Once that was remedied, he finally turned the corner to true recovery. On September 11, 2001, the Twin Towers were attacked; that same day, Ben went home. Now aged 24, Ben has just completed an arts degree, and is busy promoting his riveting and beautifully written book while co-writing a travel guide about Dublin. He's in great shape now, is Ben. May he stay like that for a long, long time. Our friend Mitch's son Elan is going through a tough time. Mitch and his family were so good to us when you were alive and when you got really sick. It was nice that Hope for Henry could do a little something for Elan. Jasper Miles and mum Brooke. JASPER Miles is one of only four children in WA with a rare life-threatening disease, but his mum Brooke has hope a cure will be found so he can outlive her. Diagnosed with fanconi anaemia in February last year, the five-year-old has blood tests every three months and bone marrow tests every year to make sure his condition has not worsened. Jasper has a high risk of developing head and neck cancer, leukaemia and bone marrow failure and has a life expectancy of 29. Brooke said she and husband Paul had to be positive about the future and “not be reactive but proactive”. Having an early diagnosis helped. She said the doctors could not explain Jasper’s abnormalities such as his small size when he was born and after years of blood tests and referrals from pediatricians to geneticists since he was six months old, the rare diagnosis was made. “We are actively looking for a bone marrow match and are on the national registry,” she said. “We feel it gives us more control. “He is healthy at the moment and we don’t really need to worry about things too much. Brooke said Jasper, who only had a 25 per cent chance of being born with fanconi anaemia, had some idea he had the disease. “We told him he has special bugs and got half from mummy and half from daddy,” she said. “He says ‘I don’t want my bugs’ and ‘why do I have to have them?’. Brooke, Paul and Jasper have met other families dealing with fanconi anaemia and Brooke said they offered each other much- needed support. She said in the past year alone, with medical research and advancements, the life expectancy had increased from 21 to 29. “Medicine moves foward and you have to have hope,” she said. Brooke is fundraising to raise money for further research into the disease. She sells key chains and other items and said she wanted to increase public awareness about the disease. “There is something special about the FA kids and we have to do what we can to find a cure, because if we don’t no one else will,” she said. To donate, visit www.fanconi. org.au. And check out Jasper’s website at www.jaspermiles.blogspot. com. (Nov 7, 2008) It was Keswick Blake's first time giving blood. The father of three hopes his donation yesterday will inspire others of ethnically diverse backgrounds to give blood and register to donate stem cells. His two sons, seven-year-old Lucas and five-month-old Owen, have rare blood diseases and desperately need to match up with a stem cell donor. But there still aren't enough people from ethnically diverse backgrounds donating to find a match, said Teri Crutcher, a donor management co-ordinator with One Match Stem Cell and Marrow Network. Blake is Jamaican and his wife, Manuela, is Portuguese. Their sons suffer from Fanconi anemia, a rare genetic disease that destroys the body's ability to reproduce blood cells. While Owen is doing well, Lucas's condition is causing him to be much more physically weak and tired, Manuela said. Lucas is home-schooled to avoid catching a cold, which would debilitate his already weak immune system. Both boys need a marrow transplant, Lucas much sooner, his mom said. The Canadian Blood Services needs more people who are black, biracial or of European descent to register to donate stem cells to better find a match for the two boys. Since The Spectator first wrote about the family's plight in September, 3,900 people have registered to donate stem cells, up from 1,700 in the September-to-November period last year. They still haven't found a match, though. In Canada, 83 per cent of stem cell donor registrations are caucasian, which includes Portuguese. Less than 1 per cent of stem cell donor registrants are black, Crutcher said. "There are a lot of misconceptions surrounding stem cell donation in ethnic communities," Crutcher said. "It is a hurdle for us to overcome," Crutcher added. Some recent immigrants voice superstitions around giving blood, while other misconceptions include unwarranted fears the stem cell donation procedures are painful, she added. Canadian Blood Services has been making inroads in diverse communities and is working with student groups at colleges and universities, including McMaster, to encourage people to donate, she said. "Canada's population has grown more diverse over the past 10 years," she said. "As the face of Canada changes, we have to respond to that." When people register to donate stem cells, they must be matched first before actually donating. To register, go to www.onematch.ca. allen has shared a photo book with you. He has been saying how he wishes he knew you. I hope that this helps him. It can sit on his night table with all of his baseball books.